, esq. F. A. and L. S. S. was born at Deal in Kent, Sept. 7, 1735; and was for many years an eminent surgeon at Sandwich, in the same county. He was the eldest of two sons of the late William Boys, esq. | commodore by commission in the royal navy, and lieutenant-governor of Greenwich hospital, by his wife Elizabeth Pearson of Deal; and was descended, paternally, from an ancient and knightly family, who were seated at Bonnington, in the parish of Goodnestone, in Kent, at the beginning of the fourteenth century. Mr. Boys, early in life, shewed a strong propensity to cultivate literature and science. Every moment he could spare from his professional duties was devoted to some useful pursuit. Residing within a mile of Richborough, (the ancient fthutupium,) he was soon led to investigate the history of his neighbourhood. He acquired an uncommon facility in decyphering ancient Mss. and inscriptions; and being fortunately in very easy circumstances, independently of his professional income, he was enabled to gratify his taste at no inconsiderable expence; and gradually collected together many valuable and curious books, manuscripts, coins, and other antiquities. He likewise applied himself with great zeal and success to the study of natural history; to mathematics, astronomv, and other branches of philosophy. 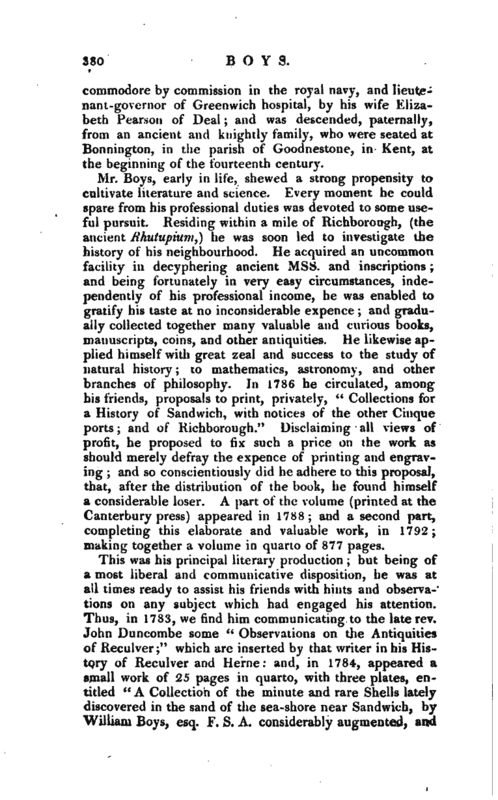 In 1786 he circulated, among his friends, proposals to print, privately, “Collections for a History of Sandwich, with notices of the other Cinque ports; and pf Richborough.” Disclaiming all views of profit, he proposed to fix such a price on the work as should merely defray the expence of printing and engraving; and so conscientiously did he adhere to this proposal, that, after the distribution of the book, he found himself a considerable loser. A part of the volume (printed at the Canterbury press) appeared in 1788; and a second part, completing this elaborate and valuable work, in 1792; making together a volume in quarto of 877 pages. This was his principal literary production; but being of a most liberal and communicative disposition, he was at all times ready to assist his friends with hints and observations on any subject which had engaged his attention. Thus, in 1783, we find him communicating to the late rev. John Duncombe some “Observations on the Antiquities of Reculver;” which are inserted by that writer in his History of Reculver and Herne: and, in 1784, appeared a small work of 25 pages in quarto, with three plates, entitled “A Collection of the minute and rare Shells lately discovered in the sand of the sea-shore near Sandwich, by William Boys, esq. F. S. A. considerably augmented, and | a11 their figures accurately drawn, as magnified with the microscope, by George Walker, bookseller at Faversham;” which in the preface is candidly acknowledged, by the editor, to be the joint production of Mr. Boys and himself, assisted by their common friend, the late Edward Jacob, esq. of Faversham. Plancus, in a treatise “De Conchis minus notis,” printed at Venice in 1739, is the only writer who had before described shells so minute as those which are the subject of Mr. Walker’s work. In 1787, Mr. Boys printed, in 40 pages quarto, an affecting narrative, drawn up by his father, lieutenant-governor Boys, and left by him in manuscript (a copy of which has since been inserted in the History of Greenwich Hospital), entitled, “An account of the Loss of the Luxborough Galley by Fire, on her voyage from Jamaica to London, with the sufferings of her crew, in the year 1727; by William Boys, second mate;” to which he added a preface and an appendix containing some additional anecdotes of the sufferers. In 1792, Mr. Boys communicated to the society of antiquaries “Observations on Kits-Goity house in Kent,” which have been inserted in the Archaeologia, vol. XL; and Mr. Pennant, Dr. Latham, and many other antiquaries and naturalists in their respective works acknowledge their obligations for assistance contributed by him. Dr. Latham, in his Index Ornithologicus, has given his name to a new species of Fern communicated by Mr. Boys. In 1787 Mr. 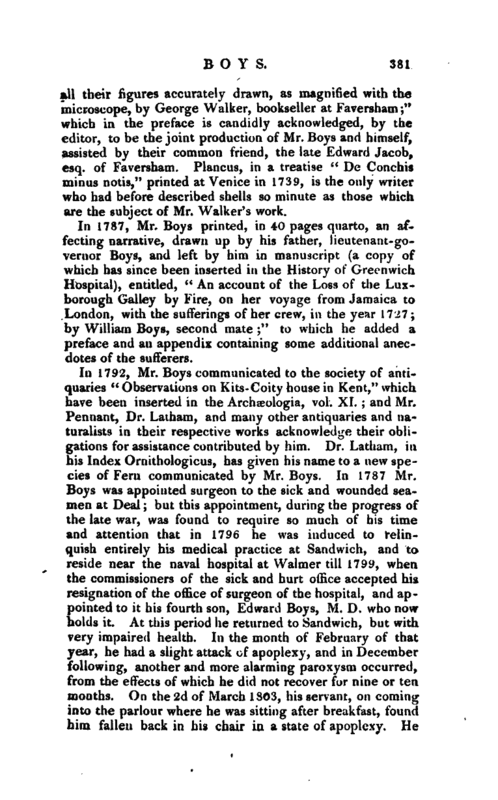 Boys was appointed surgeon to the sick and wounded seamen at Deal; but this appointment, during the progress of the late war, was found to require so much of his time and attention that in 1796 he was induced to relinquish entirely his medical practice at Sandwich, and to reside near the naval hospital at Walmer till 1799, when the commissioners of the sick and hurt office accepted his resignation of the office of surgeon of the hospital, and appointed to it his fourth son, Edward Boys, M. D. who now holds it. At this period he returned to Sandwich, but with very impaired health. In the month of February of that year, he had a slight attack of apoplexy, and in December following, another and more alarming paroxysm occurred, from the effects of which he did not recover for nine or ten. months. On the 2d of March 1803, his servant, on coming into the parlour where he was sitting after breakfast, found him fallen back in his chair in a state of apoplexy. He | remained in this state, but with symptoms which, for some days, at intervals, encouraged his friends to hope that he might still recover, till the 15th of the same month in the afternoon, when he placidly breathed his last. 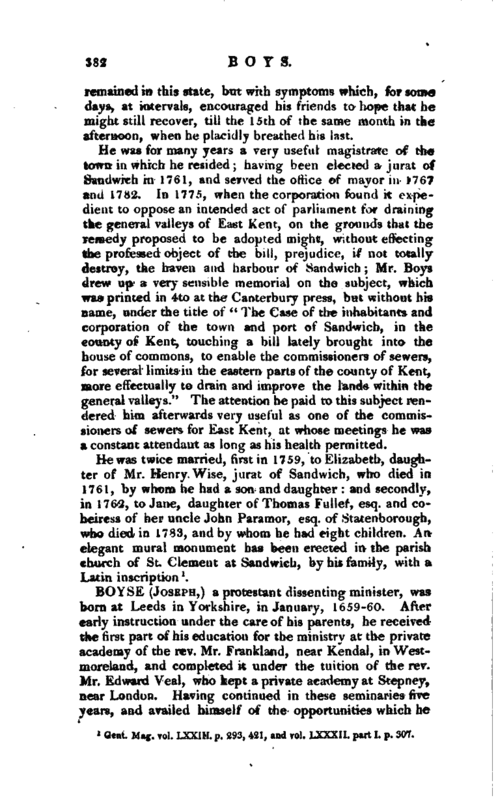 He was for many years a very useful magistrate of the town in which he resided; having been elected a jurat of Sandwich in 1761, and served the office of mayor in 1767 and 1782. In 1775, when the corporation found it expedient to oppose an intended act of parliament for draining the general valleys of East Kent, on the grounds that the remedy proposed to be adopted might, without effecting the professed object of the bill, prejudice, if not totally destroy, the haven and harbour of Sandwich; Mr. 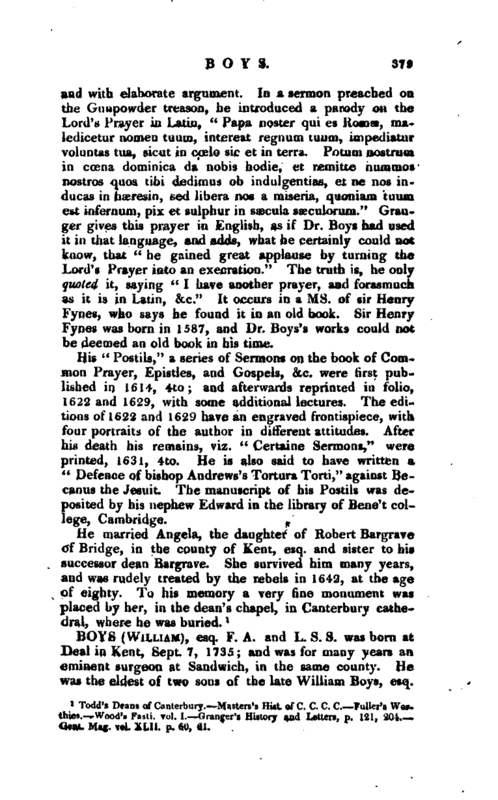 Boys drew up a very sensible memorial on the subject, which was printed in 4to at the Canterbury press, but without his name, under the title of “The Case of the inhabitants and corporation of the town and port of Sandwich, in the county of Kent, touching a bill lately brought into the house of commons, to enable the commissioners of sewers, for several limits in the eastern parts of the county of Kent, more effectually to drain and improve the lands within the general valleys.” The attention he paid to this subject rendered him afterwards very useful as one of the commissioners of sewers for East Kent, at whose meetings he was a constant attendant as long as his health permitted. Gent. Ma. vol. Lxxih. p. 293, 421, and vol. LXXXII. part I. p. 307.